Dr. Harmon received her undergraduate degree in Chemistry from Georgia Southern University. 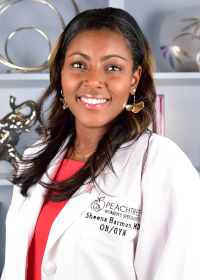 She graduated from the Morehouse School of Medicine and completed her obstetrics and gynecology residency at Rush University Medical Center in Chicago, Illinois. At Loyola University, Dr. Harmon was a two-time recipient of the Excellence in Teaching award for outstanding student teaching. During her residency, Dr. Harmon received the Robert J. Clapp Diversity Leadership Award and the Diversity, Equity, and Inclusion Leadership Award. When not caring for patients, Dr. Harmon enjoys cooking, traveling, kayaking, biking, visiting planetariums, and playing the piano and flute.